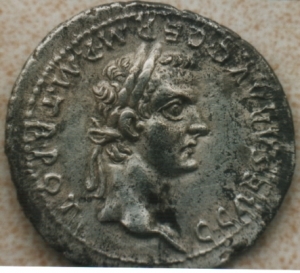 Frank, a member of our Julio Claudian group was blessed enough to find this silver denarius with Germanicus reverse. I did not want to lose the information so I finally got around to putting into the Juio Claudian pool, Amazing find Frank!! Could you imagine finding a piece of Julio Claudian history in the terra! Here are some details of the find. In fact, this denarius of Caligula is part of a small treasure of 20 denarii, scattered over a small area of semi-arid scrub land, near the ancient roman city of Nemausus (today Nimes). Thanks to the calcarious soil the coins did not suffer corrosion. Besides some broken roman tiles, the area was virgin. It was evidently a site where was located a small country house, modest in all ways and deserted ever since the first century AD. Through the wear of the coins, from republican denarii, gallion types of Marcus Antonius, several Augustus denarii and the common Tiberius denarius with Livia seated, it can easily be concluded that the 20 denarii were hidden or lost at one time, about 38 AD, because the wear of each coin was equivalent with the age as compared with the most recent one (of Caligula). Nothing else was found here, except a small copper Gallic coin, much older, and, since it was in superb condition, using the same wear/age considerations, was lost about a hundred years earlier. 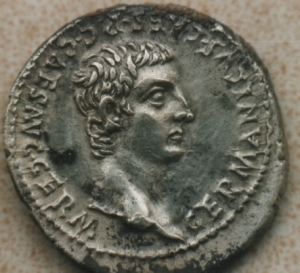 Knowing that the salary of a common soldier at that time was about one denarius a day, the amount of denarii found here was quite considerable. The brown margin on top of the reverse is concretion (some people mistakenly thought the coin is subaerate). As the above information is first-hand, I can guarantee the coin is genuine. For sentimental reasons the coin is not for sale, but I’ll be happy to contribute to numismatic science by publication of its image Regards Frank. This was sent to me by Frank where he found this denarius of Caligula. Frank granted us at the Julio Claudian Iconographic Association permission to use photos.